It’s FINALLY SPRING, which means it’s time to put on your Spring cleaning pants and work yourself into an organizational frenzy!!! Okay perhaps a frenzy isn’t necessary, but it is the perfect time of year to take a look at which areas of your home could use some sprucing up. 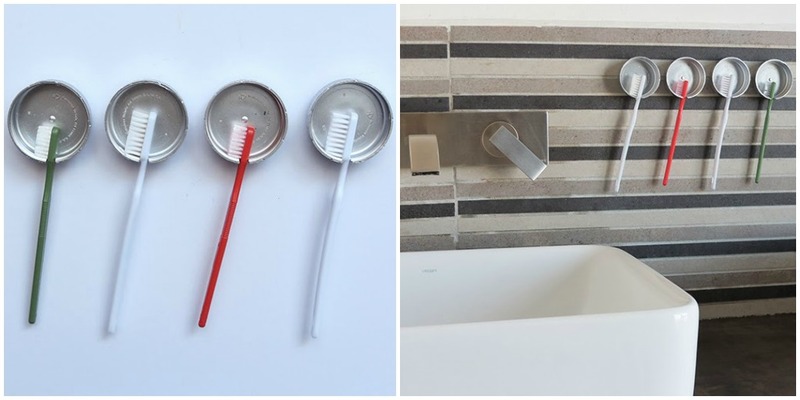 The bathroom is one spot where simple organizational improvements can make a powerful style impact, and that’s where we will be focusing this list – specifically, on toothbrush storage. If you’re simply stowing your brushes away in a drawer, then you’re missing out on an easy opportunity to upgrade your space’s style! 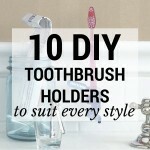 No matter what your aesthetic is, be it minimalist, eclectic, chic, or rustic, we’ve gathered 10 of the best DIY toothbrush holder projects to suit every style. Click any of the images below for a closer look. Crisp white decor elements are at once timeless and trendy, which means this is one project that will never go out of style. 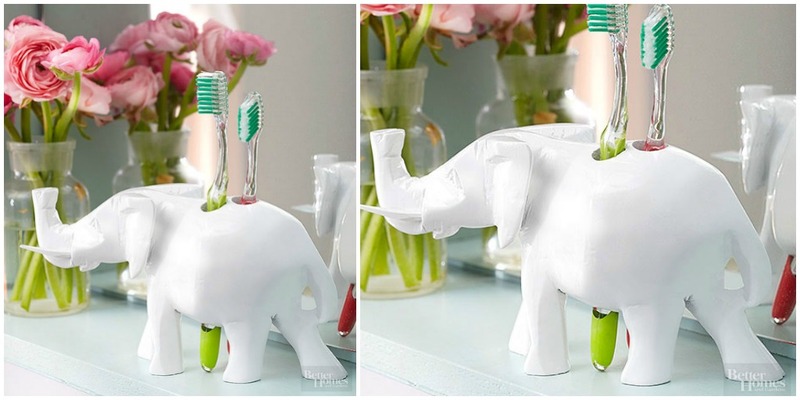 This glamorous elephant toothbrush holder utilizes a wooden figurine that was purchased at a secondhand store and then spray painted glossy white. 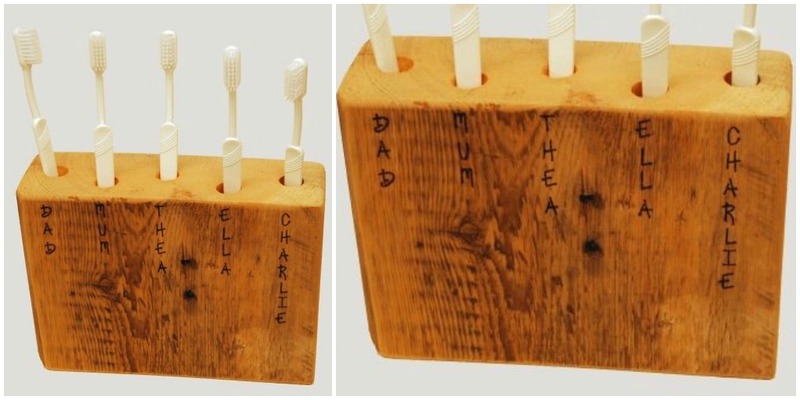 A 3/4-inch drill bit was used to make the holes, which are the perfect size for traditional manual toothbrushes. Have fun thrifting and locating a wooden figurine that means something personal to you and your family! PVC piping is a practical material that need not remain “behind-the-scenes,” as demonstrated by this DIY. It utilizes 1-inch PVC pipes and end caps, both of which can be found at your local hardware store. The monogrammed initials were die cut from vinyl for maximum durability, but regular stickers would work just fine, as would skipping the lettering entirely for an even more industrial look. 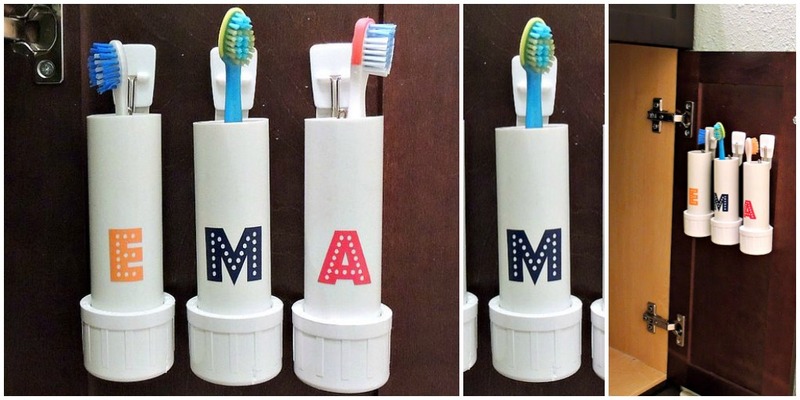 Just make sure you know whose toothbrush is whose if you skip the labeling step! 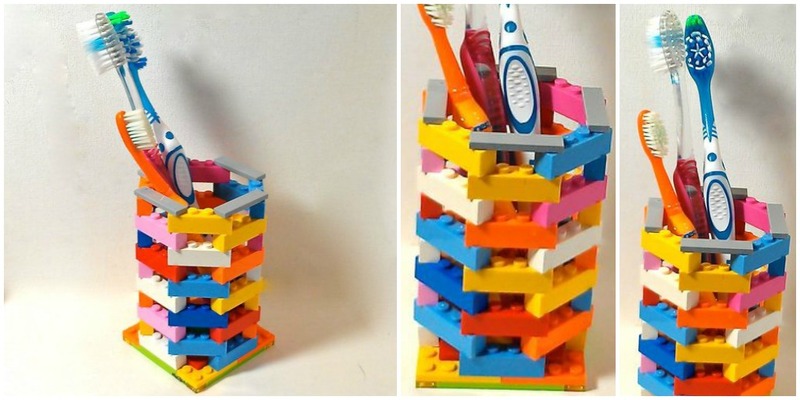 How cute would this LEGO toothbrush holder be in the “kids bathroom?” This project is especially great since kids can build it all on their own, and it will surely make them more excited to brush their teeth since they’ll be able to admire their handiwork at the same time! With a rainbow of colored blocks available, this particular holder can be customized to fit any color scheme. Here’s a fun YouTube video which shows another style of LEGO toothbrush holder, constructed by a father and daughter duo. Reclaimed/recycled wood is extremely popular right now due to both its aesthetic appeal and its sustainability. This awesomely rustic distressed wood piece would be just as at home in an old cabin as it would be in a downtown high-rise! As with the elephant project, we suggest drilling the holes with a 3/4-inch drill bit, and sanding if necessary. If you like the simplistic look of uniform toothbrushes, our classic Patterson brand brushes come in several colors and would be a great choice. An optional finishing touch is to use a woodburning pen to carve out your family’s names as pictured above. Perfect for a bathroom that favors a bit of whimsy, this prehistoric project would provide any space with a fun pop of color. Best of all, this craft is extremely affordable since large plastic dinosaurs can often times be found at the dollar store – just keep an eye out! 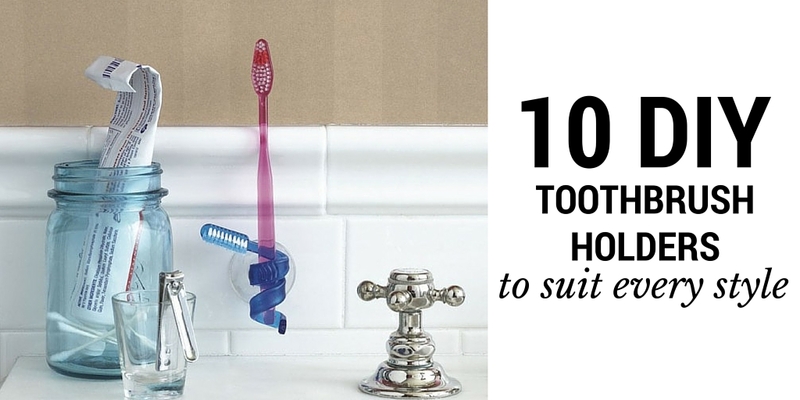 A word of caution: even though this looks like a kid-friendly DIY, mom or dad will definitely need to help when it comes to using a craft knife to cut the openings for the toothbrushes. This toothbrush holder, made from a fork with bent tines, would fit perfectly into an eclectic home with a little bit of everything showcased inside. In case you’re doubting your ability to bend cutlery, just think what happens when you try to scoop frozen ice cream out of the tub! (Just us? Hehe.) Seriously, though, if you have any concerns about how easy fork tines are to bend and shape as you please, take a look at this helpful video tutorial – all you need are some basic tools like pliers and a wrench! 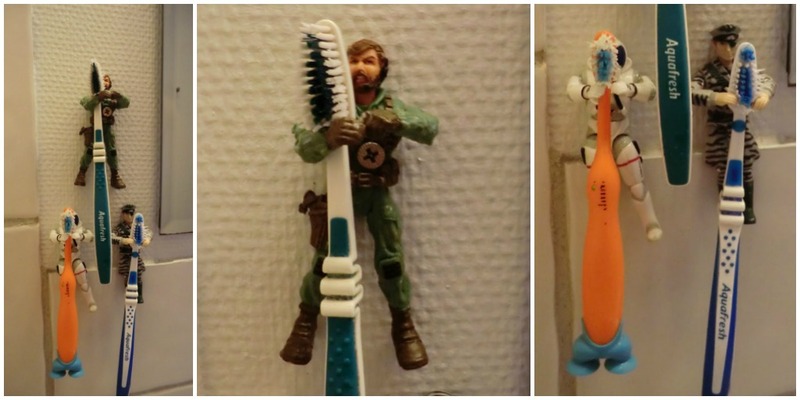 What a fun way to keep your favorite action figures around just a little bit longer. This is perfect for kids ages 5-8, or even kids at heart ages 50-80! Of course you will need to screw a hole through the middle of your figurine, so it’s probably best not to use the most expensive members of your collection. In addition to a drill and a screw, all you’ll need for this project is a bit of super glue in order to lock each figure’s arms in a loving toothbrush embrace. 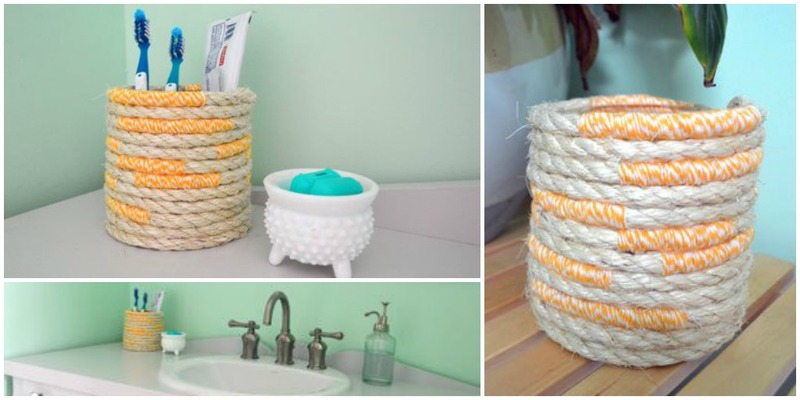 Anchors, seashells, mermaids, rope…nautical decor is right on trend this year and this simple DIY rope toothbrush holder would fit right in to the mix! All that’s needed for this project is a hot glue gun (which any DIY maven already owns), a glass vase (again, try your local dollar store), and a spool of sisal rope. The project above also uses colorful kitchen twine wrapped around the rope in random intervals, but that step is optional! When all is said and done, this is a little project (takes less than an hour) that makes a big style impact. “You’re trying to tell me that those modern, expensive-looking silver circles are just plastic bottle caps that have been painted?” Heck yes, that’s exactly what we’re telling you! With a bit of silver spray paint, a ‘throw-away item’ can become elevated and worthy of residing in your contemporary bathroom. The caps are even attached to the wall with velcro so that they can easily be removed for cleaning. The tutorial also (wisely) cautions that non-toxic paint should be used on the caps. Is there anything more meta than a toothbrush inside a toothbrush? It’s like the craft version of the movie Inception! 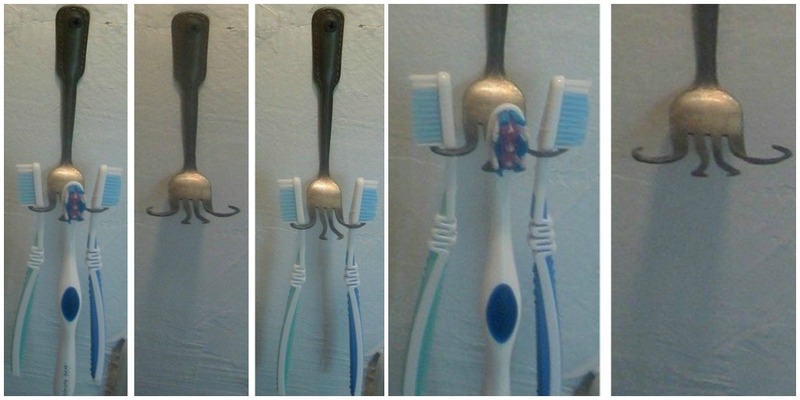 As you may recall from our toothy Valentines blog post, we’re fascinated by projects which feature melted toothbrushes, and we remain intrigued by how easily they can be shaped after being submerged in boiling water for a few seconds. 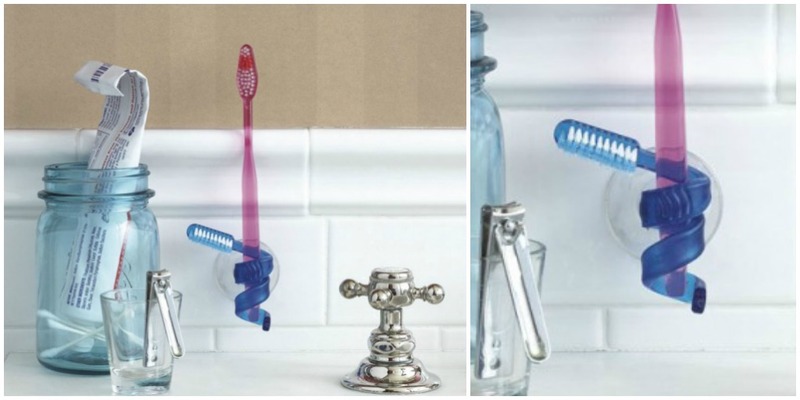 After twisting the toothbrush into your desired number of coils, attach it with super glue to a suction cup and your thought-provoking toothbrush holder is ready to fascinate powder room guests! What’s your decor style? 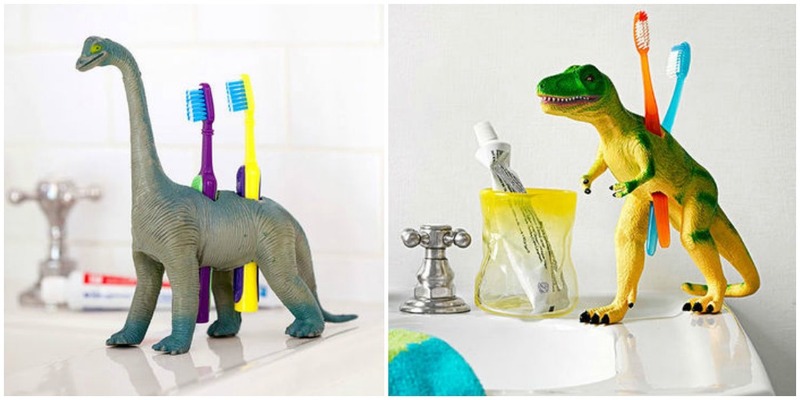 Can you see any of these toothbrush holders fitting into your home’s bathroom aesthetic? Let us know in the comments below! If you do end up attempting any of these projects, send a picture of your craft masterpiece to socialmedia@pattersondental.com, or tag us on your social media account of choice! Hi Aleksandra, you have dragged a unique topic here about home improvement, especially you have spotted bathroom, that idea is nice. It is the area, from where we start our day, usually. So, keeping it hygienic and fresh should be our first priority. This habit will keep our dental health well. And the different types of holder you have shared here are appreciable. Interesting read! Hello to the Fabey Dental team, and thanks for your kind words! Completely agreed that the best way to kick off a day of healthy habits is by starting first thing in the morning, with a clean/fresh/organized/hygienic teeth brushing session! This craft is so cute and my little one would love making one. Thanks for the idea! How sweet, Natalie! Please do send us a picture of her final product 🙂 Thank you for the feedback.